Dorah's tissue expander started to extrude and had to be removed in August 2011. July and August 2011 were not good months for tissue expansion at Children of Fire. Dorah's expander (pictured) was being filled externally and then developed a "blister"; And both Dikeledi's expanders deflated. 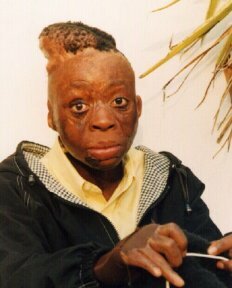 Thapelo Phore (5) had tissue expansion in early 2011 to try to restore his scalp by stretching the other hair-bearing skin on his head. The expander was folded in one small area and it extruded through his scalp. After attempts to stitch the skin above, it ultimately had to be removed with no progress made. This was at significant cost to the charity. The procedure will be reattempted in September 2011 if a surgery date can be obtained. 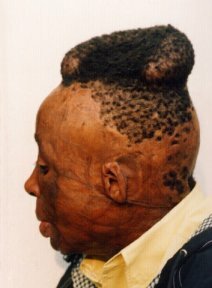 Sicelo Maduna had a tissue expander on his scalp, to try to rebuild a nose for him, in September 2006. The expander was regularly filled with saline but the process took a year because it leaked and because he had complications by also being HIV positive. 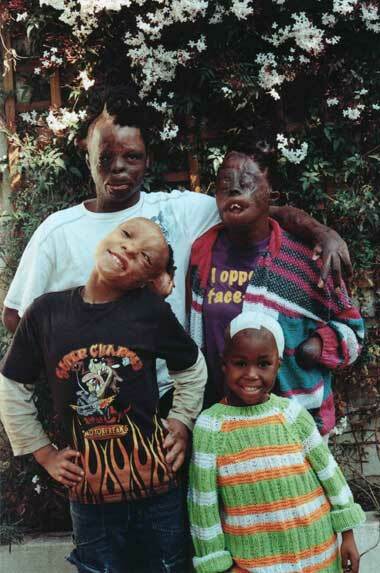 Nsizwazonke Vilakazi (18), Sizwe Hlope (9) and Dorah Mokoena (16) all had their tissue expander expansion-with-saline and removal delayed by the civil servants strike in South Africa in August /September 2010. If an expander is left under the skin for too long, a process starts whereby the body tries to create bone around it (ossification) which can ultimately make it less successful. 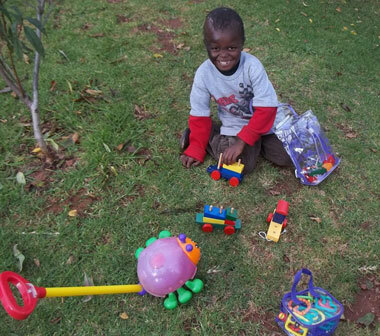 Seiso Ratswana (5) had his two expanders removed after one was burst when playing with a very soft balloon-like ball. It was a full week before it was removed despite the sudden deflation; both bubbles were already very full at that time. 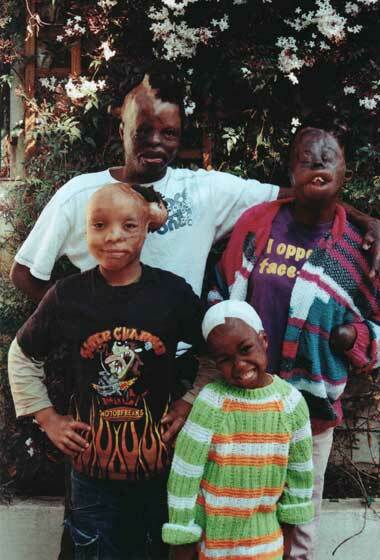 Tunisian burns survivor Sameh with her young South African friend Zenette in July 2008. 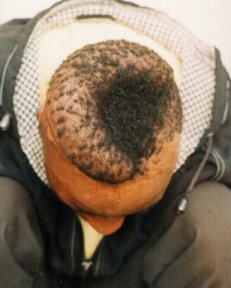 Zenette�s hair-bearing scalp was stretched over many months with injections of salty water (saline) into a medical balloon (a tissue expander) so that the same amount of hair could cover a larger area of her scalp. This allows children to feel more at ease with their appearance and cuts down on teasing. It can be continued in future. When a tissue expander is placed anywhere in the body, to make more skin � often to make more hair-bearing skin � there is ossification around the port. (The port is where the saline is injected to fill the expander). This means that the body tries to make bone around that part of the device. This should dictate where the port is placed. 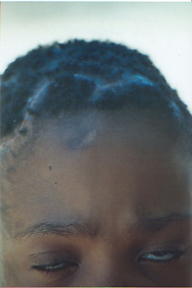 It is not ideal for the port to be on a child�s forehead as she will then have a lump and a scar in a highly visible position, as with the girl in the photo. However one of the good effects of ossification is when every scrap of bone can be used to rebuild a child. 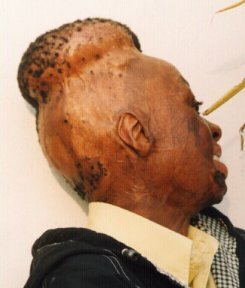 When Feleng Mahamotse has his scalp expanded prior to rib placement in his forehead bony deficit, the small amount of extra bone that is likely to be generated, will be ground down and used in the forehead-replacement process. Tissue expanders are inflated by plastic surgeons to stretch the skin. This is either to allow something to be placed underneath the skin such as a false breast after mastectomy, or to stretch the skin to cover a wider area. For children with burns, they frequently lose hair roots on part of the head. By inflating a sort of sack or balloon beneath the remaining good hair, it can be stretched and eventually cut and stitched into position, so that the skin with hair roots covers the whole scalp. This does not make more hair. It redistributes the same amount of hair over a wider area - a bit like the difference between a lush lawn and scrubland. Nonetheless, it can look very good once it is completed. If there is not a lot of hair left after the child has been injured, it may not be worth the cost and discomfort of carrying out the procedure. 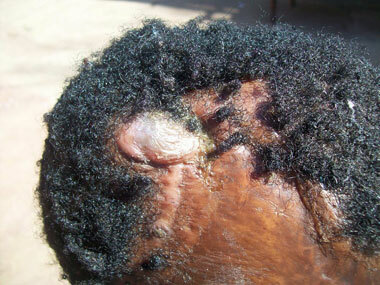 Sometimes there is other damage to the skull or scalp that also makes it unlikely that the procedure will work. A child may have a bony deficit (i.e. a hole) under the skin after burns. This can be a problem for tissue expanders. There can also be a problem is such a hole has subsequently ossified - filled up with lumpy bone some time after the injury. A tissue expander can only be used on the scalp if there is underlying bone. The tissue expander has a valve. The expander is inflated by injecting in sterile saline solution, typically once a week. The amount of saline added each time is determined by discolouration of the skin at the edges, as the liquid is added - and also by the amount of pain or discomfort that the child can bear. 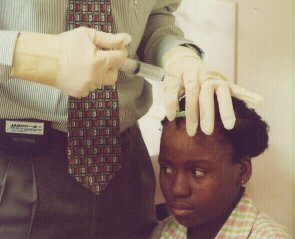 Agnes Mohasa (pictured), age 12, whose scalp was expanded with injections of saline into a tissue expander. Including failed valves and damaged expanders, it took over a year to get the process right. She hopes to have a more normal hairline by July 2001. Mfundo Ntamehlo is undergoing the same process, at about 50 millilitres of saline injected each week, at Milpark Hospital, Johannesburg. In the weeks / months in which the child is using a tissue expander, their head is a very strange shape and they can be subject to ridicule if their schoolmates don't have the concept explained in advance. The tissue expanders can leak. And the skin should not be knocked while they are in place. Some hospitals use second hand tissue expanders. Too many parents take their children out of school while the expanders are being used, typically putting the child a year behind her peers. No tissue expanders are made in South Africa. Three companies that make the devices are called Laborataire Euro Silicone (France); Mentor (USA) and McGann (USA). Johannesburg-based Conquest Medical imports the French ones into South Africa. They were selling for R2166 (including VAT and valve) but the price rose on Feb 1st to R2451. It is important to know the price as the charity has received allegations of one medical worker inflating the price to a poor family by an additional R1900. The devices are bought regularly by the Red Cross Hospital and Groete Schoer in Cape Town and sporadically by Wentworth (Durban); Chris Hani Baragwanath (Soweto) and rarely by Johannesburg General Hospital. All these hospitals used to use a lot more tissue expanders. Now surgeons in private practice are the main customers and their tissue expanders are mostly acquired to use for breast reconstruction. Children who have been assisted by the Charity in some capacity and who have benefited from tissue expanders include Mfundo Ntamehlo, Lesedi Moila, Samkelo and Agnes Mohasa. 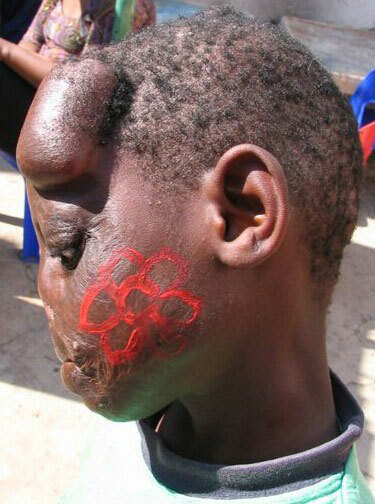 Oscar Hadebe, age 7, will have tissue expanders used over his stomach area to produce more skin to improve the severe keloiding of his face, around July 2001. His mother was convinced that tissue expanders would damage his ability to digest food so it is important that medical staff explain the method, with pictures, to both child and parent, to minimise anxiety. Mfundo's mother too was scared of the concept and took her son to see a traditional healer - who then told her that Mfundo would die if anything was put under his skin. When Mfundo understood the concept, he managed to explain it to his mother and to allay her fears. The series of photos below show the tissue expansion work that is currently being performed on Mfundo Ntamehlo.